*Original story available on WKU News. Please visit https://wkunews.wordpress.com/2015/03/23/achca-2015-conference/ to be taken directly to the story. Seven WKU students and one faculty member from the Department of Public Health’s Health Care Administration (HCA) and Long Term Care Administration (LTCA) Certificate Program recently traveled to Rising Sun, Indiana, to attend the American College of Health Care Administrators’ (ACHCA) regional District 3 Meeting. Despite last minute transportation challenges and forecasts of winter storms across Kentucky and Indiana, students still found their way to attend the annual district conference known to offer excellent education and networking with long term care (LTC) professionals. Students from WKU, LTC professionals and academics from Kentucky, Ohio, Indiana, Michigan and West Virginia gathered for the three-day affair March 4-6 to satisfy continuing education requirements, network with vendors and peers, and participate in a variety of meetings and social events, including an awards banquet. Several students connected with professionals to discuss future internship and administrator in training (AIT) opportunities. The Kentucky Chapter of ACHCA presented awards to SHA Vice President Trevor Davis of Louisville, a health care administration student pursuing the LTCA Certificate Program, and HCA faculty member Melanie Eaton. Davis’s second award, the Phil McConnell Scholarship Award, is an annual national award given to two students each year to cover expenses to attend the national ACHCA Convocation, with only one award given to a non-Ohio student. Davis is only the second student at WKU to receive this award. Eaton received the Bridging the Gap Award for her continued efforts in promoting student involvement both within and outside of the classroom. “The Bridging the Gap Award was created this year for Mrs. Eaton because she has utilized her role as a leader, LTC professional, and instructor to bridge the gap between students of today and leaders of tomorrow,” Ray said. This is the second consecutive year Eaton has received an award at the district meeting for her contributions to the long term care profession. Students who attended the conference included Trevor Davis of Louisville, Laura Allen of Edgewood, Fred Rowe of Bowling Green, Faith Akhuetie-oni of Minnesota, Monalisa Eda of India, Betty Richter of Elizabethtown and Marivic Alvear of California. 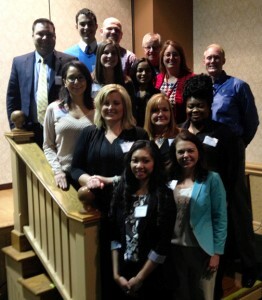 WKU Public Health students, alumni and faculty and Kentucky long term care leaders attended ACHCA’s District 3 Meeting in Rising Sun, Indiana.